Every year, FADER makes an Icon issue. We have featured artists like Aaliyah, Shabba Ranks, Nina Simone and David Byrne, musicians whose impact feels so large it's almost unknowable. We've always tried to parse their influence by speaking with friends, family and fans to create a portrait of their lives both in and outside of music. 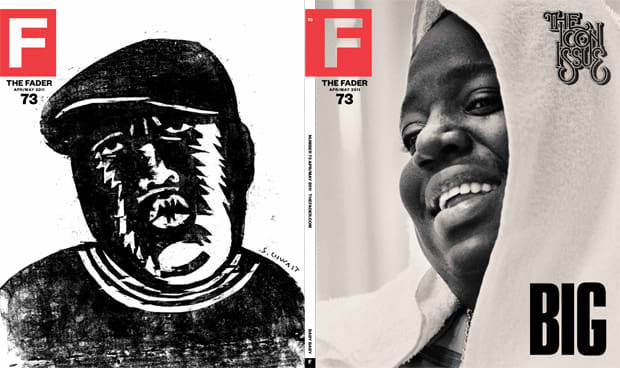 However, with an artist like Notorious BIG, the subject of this year's issue, much of that work has already been done because Big was so beloved. We're not trying to compete with Notorious (shout to Gravy, though), but we set about painting a portrait of Big both as a rapper and as a regular dude. In our issue you'll read accounts from the intern who witnessed Big and Tupac's first encounter, you'll hear what Puff thinks about when he listens to Biggie's music today. You'll see new photos of prominent places in Big's life, from the tunnel he drives through backwards in the "Hypnotize" video, to the block where he performed his infamous teenage freestyle. And you don't even have to wait for our issue's release on May 3rd to read Andrew Noz' essay about Biggie's musical legacy, that's on TheFADER.com right here, right now. There's a whole lot more to come and we can't wait for you to see it.